As winter strengthens its grip around the coast and the water temperatures begin to fall, many of our fish species dwindle. Apart from a few isolated areas and a small number of target species, angling success can be quite poor. 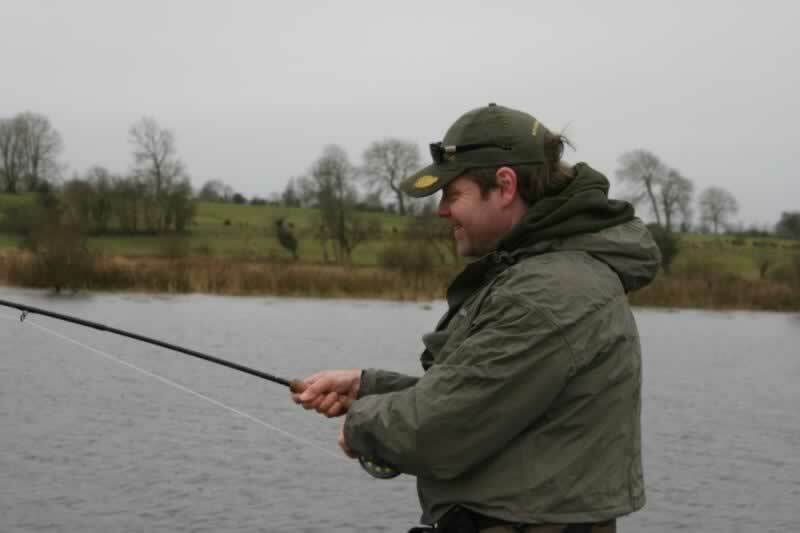 However, many anglers in Ireland today are learning to adapt, and being able to make the switch from saltwater to freshwater and vice-versa, offers opportunities to enjoy excellent sport throughout the entire year. Having targeted most species in this country, I have long been aware of the fighting capabilities of large pike, especially on light tackle. The difficult part from my own personal point of view was that most of the time I simply fished with dead baits. As everyone knows, this is a superb and extremely successful method for finding large pike, but unless these fish are in reasonable numbers, and are feeding, it can be a waiting game. This waiting game has rarely suited my style of angling, and as a result, hunting for large pike was usually set-aside for those blustery winter days when weather conditions made sea angling impossible. However, all this changed for me many years ago when I accepted an offer from Alister Smyth, owner of Tight Lines Tackle-shop in Belfast. I had been invited to spend a day afloat on a local water, and witness first hand, the merits of hooking and landing pike on the fly. 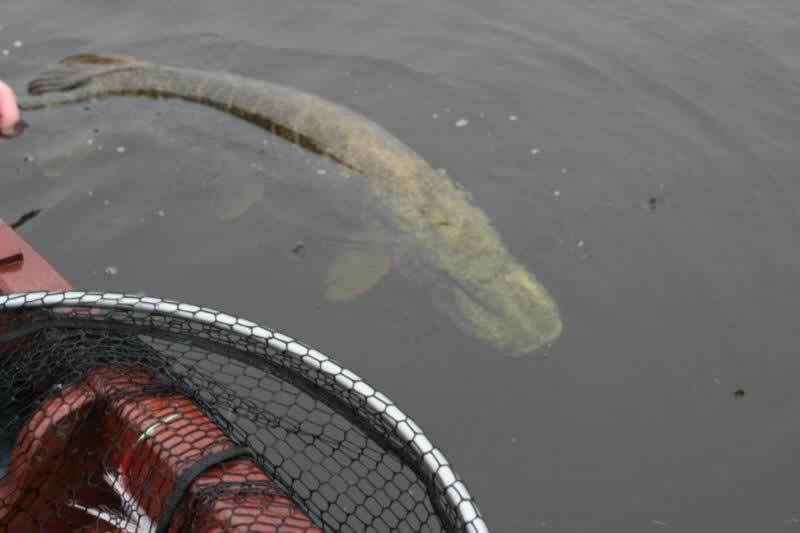 It is fair to say that this experience changed my whole outlook on pike angling. I found it new and exciting and it really put the sport back into angling, and under the correct conditions, can be absolutely unbeatable. This method also allows pike to demonstrate their fighting capabilities to the full, from the initial “take” that can only be described as heart-stopping, to the amazing acceleration and spectacular aerial displays, usually continuing until they reach the safety of the landing net. At this time, angling for pike on the fly was still in its infancy, and Alister, along with local fly-tyer, William Briggs, were among the few that were instrumental in pioneering this new branch of sport fishing in Northern Ireland. 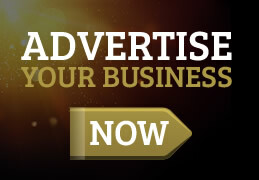 Specialised tackle that suited the task was quite expensive, but as one of the fastest growing disciplines in the tackle industry, a whole range of quality gear is now readily available, at prices to suit all budgets. This leads nicely on to what is actually required regarding tackle set up. The obvious and most important piece of equipment has to be the rod. It needs to be approximately nine to ten feet in length, with a fast taper and plenty of back bone, capable of casting a 10-12 weight line. There are two main reasons for this. The average pike fly is usually “heavily dressed” and tied on a 3/0 or 4/0 hook. These tend to be rather bulky and with little in the way of aerodynamics, require a heavier line to punch the fly out any distance. Secondly, a pike’s jaw is a tough, bony structure and a rod with plenty of backbone will aid in setting the hook on a “take”. The casting line may be considered next. A “weight forward” is arguably the best all rounder to purchase, especially for the beginner, but to cover all eventualities, this will be required in both floating and sinking versions, and possibly an intermediate version too. Prices vary considerably, but it is better to purchase a quality line for ease of casting, longevity and less tangles. 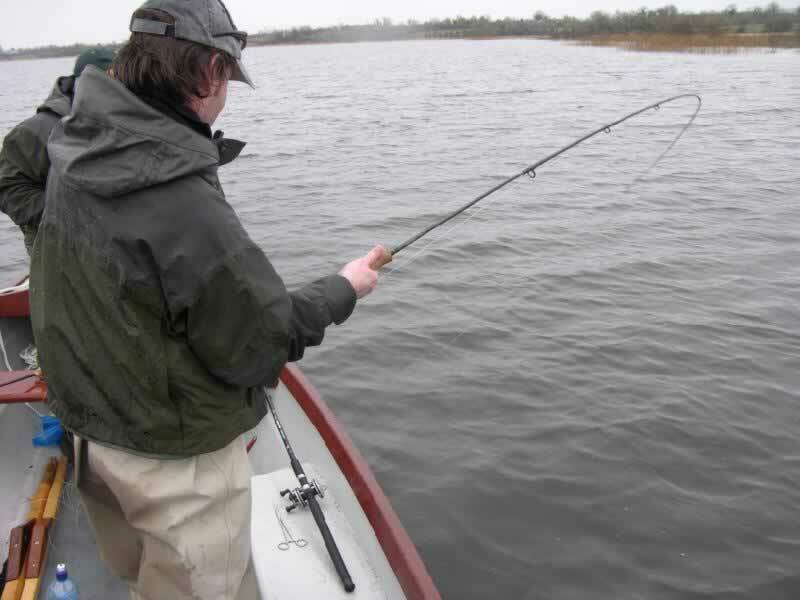 If the tackle-budget is tight, a floating line with a sink-tip would do as an all-rounder to start with. The reel on the other hand, in my opinion, need not be too expensive. 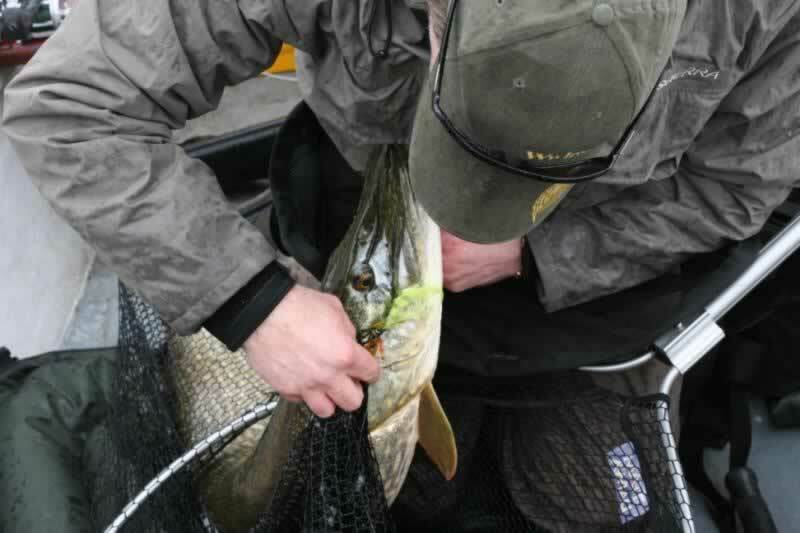 For pike angling, a fighting clutch isn’t exactly necessary, or a high-speed retrieve. These fish rarely strip line off the reel, even in shallow water, but fight with short bursts of acceleration and steady power. However, a large arbour reel is recommended, as this allows the line to be contained in larger coils and helps to eliminate tangles. 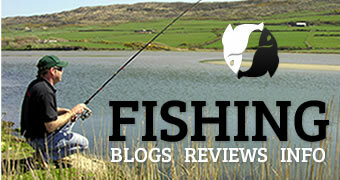 There are many to choose from in most tackle shops, and at realistic prices. That’s the main part of the tackle required, which now leaves the business end to deal with. Personally, I simply attach a braided loop to the end of the fly line; adding a drop of super glue as a safety measure, then tie on two metres of thirty pounds breaking strain Flouro-carbon as a leader. As pike are well known “toothy critters”, a biting trace must now be incorporated. There are several options available. One way is to use a quality nylon coated multi-strand wire and attach it to the leader using a grinner knot or common shock-leader knot. To attach the fly, simply put the wire through the eye of the fly, twist four or five times and gently heat with a cigarette lighter. This will fuse the twists together making a very firm and strong bond. It is a good idea as it eliminates the need for snap links and the like, reducing un-necessary weight that can cause casting and presentation problems. I have hooked and landed over two hundred pike on this set up, with fish to twenty eight pounds and have yet to lose one through tackle failure. Another option is the Kevlar, wire re-enforced, knot-able line. This contains a fine-wire and Kevlar weave that allows the angler, to some extent, to tie standard knots. Failing that, a simple, Titanium wire trace can be used, with a small swivel at one end and a link-swivel at the opposite end, but these must be strong and of the highest quality. 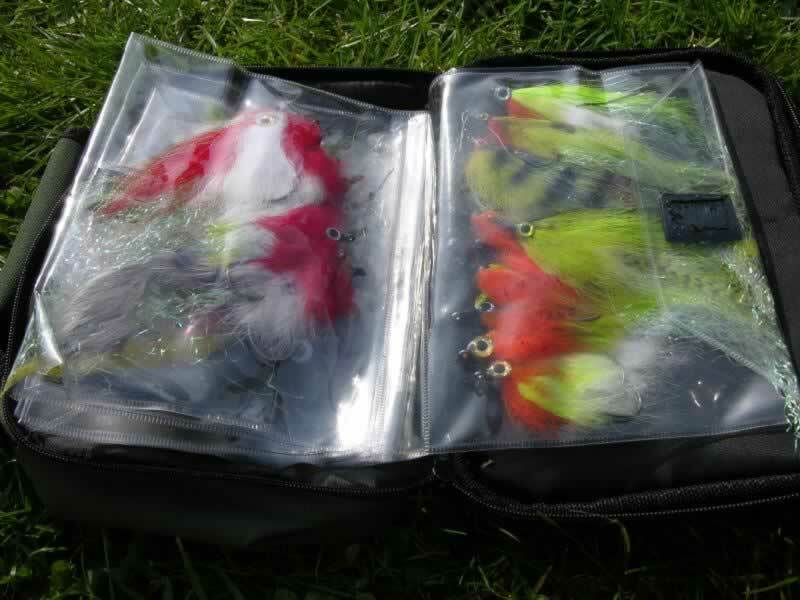 Last, but by no means least, is the actual fly or lure, and in my opinion, this is where a great deal of pleasure can be gained. 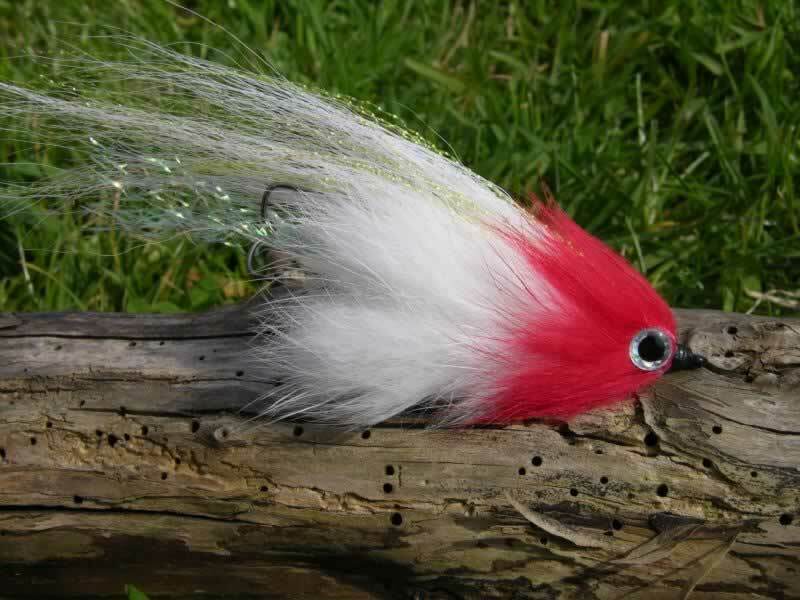 Although there are many choices of pike flies in the shops, they are so easily tied there is no real excuse for not having a go. This is a chance to allow your imagination to run riot, as the strangest patterns and gaudiest of colours are all capable of inducing a “strike” and there is a great satisfaction from hooking and landing a fish on a personal creation, no matter how well or badly it is tied. I only use flies tied by myself and enjoy great sport, and am by no means an experienced fly-tier. I would also wish to add that with all the pike I have taken to date, not one fish has taken any longer to play or land using a fly rod then it would have with a conventional dead baiting rod, and I have yet to deep hook a single fish on the fly. In fact, most of the pike are unhooked within a couple of seconds at the water’s edge and rarely need to be handled, except for weighing or photographic purposes. Carry forceps for unhooking, a padded unhooking mat for larger fish, a suitable landing net for the “crocs”, and weighing scales and weigh sling for personal records. A line tray can be useful on most occasions. 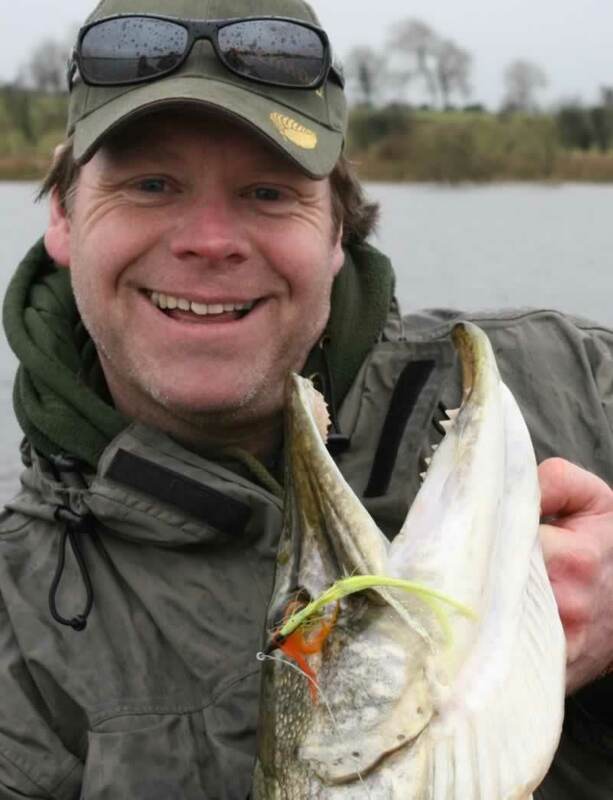 I initially expected to catch a majority of smaller pike on the fly but was surprised to find that many sizeable fish simply cannot resist the attraction of such relatively small, but naturally presented bait. I believe that this is due to the fact that a fly can be quietly dropped almost on top of a waiting fish with no fear of “spooking” it. It can be retrieved at slow and tantalising speeds and remains lifelike, and can be fished in extremely shallow and weedy areas without becoming snagged up. 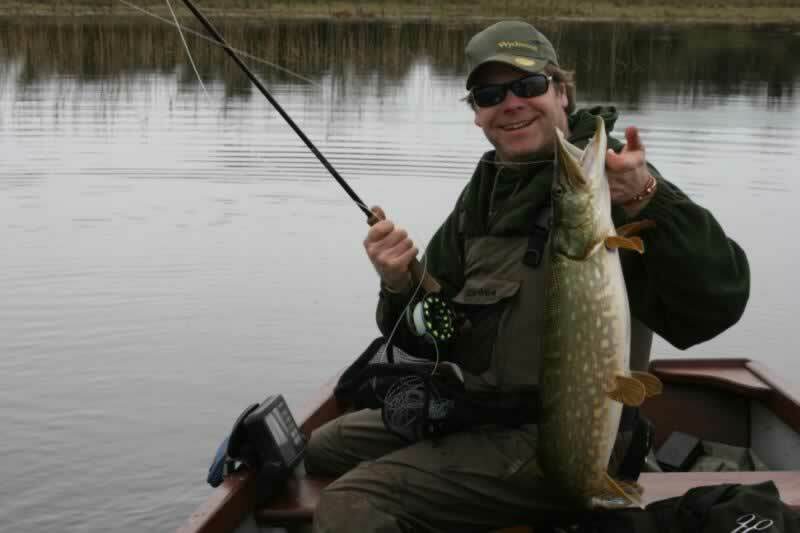 All in all, fly-fishing for pike is an extremely versatile and successful sporting method, and offers the fly angler the greatest chance of landing a double-figure fish on light tackle.